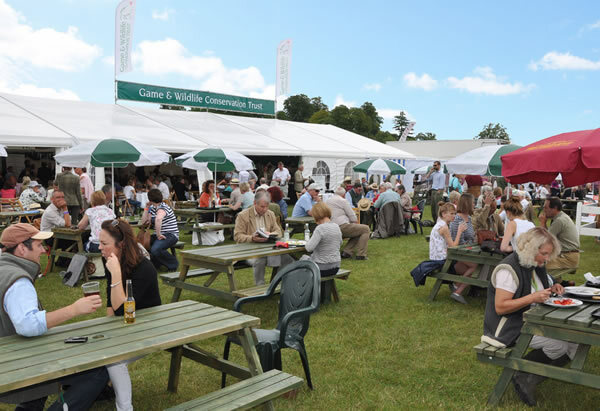 The GWCT will once again be exhibiting at the CLA Game Fair which will be held between 31st July and 2nd August at Harewood House in the beautiful Yorkshire countryside near Leeds. We would like to invite you to visit our stand to learn all about the current research carried out by the Trust, and see that research in action. You will also be able to take advantage of our welcome refreshments. The stand is a great place to catch up with your friends and guests. - The GWCT Game Fair lunch on Saturday and Sunday – a 2 course lunch consisting of a selection of cold cuts and homemade salads, both hot and cold, local bread and a choice of delicious English desserts. A vegetarian option will also be available. Lunch on the Friday will be restricted to members and their guests. - Afternoon tea cream tea, with homemade scones, strawberries and whipped Jersey cream. - All refreshments are reasonably priced, and tea and coffee will be included with all meals. • Invite your family and guests to join you for refreshments or a meal, or just a welcome sit down where you can relax after visiting the busy fair. • Meet with GWCT advisors and scientists to discuss conservation issues and learn about the Trust’s latest research. • Bring the whole family - The exhibits area will enable you to discover first-hand the research projects that GWCT scientist are currently working on. This year we will focus on encouraging a younger audience onto our stand and have exhibits of interest to them so they can learn about the countryside, wildlife management and conservation. Please rest assured that we will be providing all these facilities as cost effectively as possible, and with the help of several sponsors, so that the majority of donations will continue to go to funding the important research that we do.